In the world we live in, danger can happen at any time. Whether it’s mass shootings or domestic attacks, businesses and commercial properties always look for better ways to improve their current security. There are numerous solutions that address every circumstance or threat that could happen– that includes a specific solution for explosions. Having the right escape plan and proper planning in the event of a bomb is definitely important. 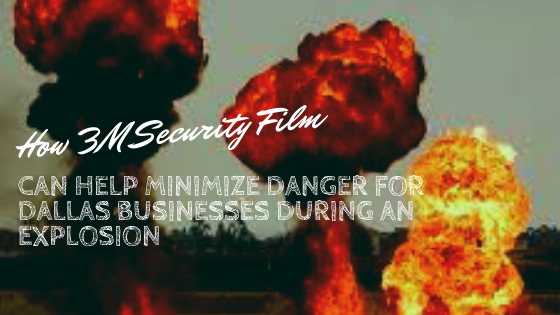 3M security film is definitely one of the most important solutions to keep in mind for potential explosions at Dallas businesses. 3M Scotchshield Safety and Security Window Film is 3M’s premier commercial safety solution. This premium security film option brings unparalleled strength and durability to all the glass elements in your business. Did you know that the broken glass shrapnel created by an explosion is often the leading cause of blast-related death and considerable injury? By mitigating broken glass hazards, businesses can actually reduce the risk of injury as well as potential death. 3M security film can be utilized for specialty security measures including ballistic resistance and bomb blast protection. Security film can defend against explosions, gunfire, natural disasters, break-ins, burglaries, freak accidents, and more. 3M security film is a great option for improving businesses and other commercial properties. 3M™ Scotchshield™ Window Film Ultra Series Blast Test for Dallas Properties from Kansas City Green Window Film on Vimeo. GreenLight Window Films is proud to be the preferred security experts in the Dallas area. We’ve worked with commercial properties and businesses throughout the nation in their security needs. 3M security film is always one of our favorite products due to its incredible properties and additional benefits that are available. Security experts are available to help you with all your needs. For more information regarding 3M security film for your Dallas property, please contact us!